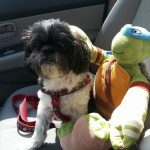 Hard to believe it has been one year since Farley, cancer fighting ninja Shih Tzu, entered my life. What is even more amazing, he is here today, fighting cancer like a champ. 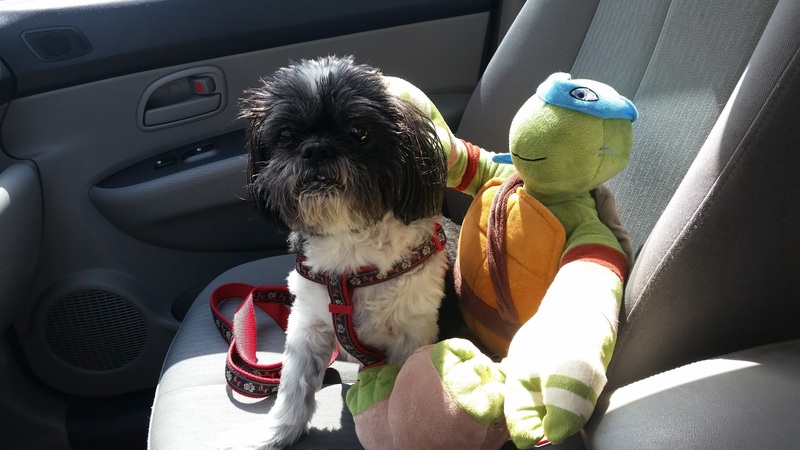 I would have never thought that this little Shih Tzu, left at a high-kill shelter here in the Phoenix AZ area by his family after 13 yrs., would be such an inspiration to adults and children. Full disclosure, if you have been following this blog (started 2011), you then know that Mr. MaGoo was the one that wrote this, this was his blog. 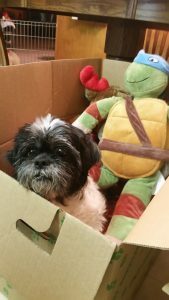 With his departure to Rainbow Bridge on May 21st, this is the first blog I have done without my partner. Mr. MaGoo, hope I make you proud, guide my fingers as I write. So, how did Farley earn his title of “Cancer Fighting Ninja”? It began July 6 2016 when I received the news that he has lymphoma with circulating leukemia. Upon learning this, I suspected that his family of 13yrs knew this and that is why they took him to the county shelter. The prognosis I was given, Farley would have anywhere from one month to three months to live. Here I was, I just said good-bye to my Carla Mae on June 6 2016 and now I will be facing this again? Yes, I know, Farley was only with me for three days; how on earth could I become that emotional with a dog that I haven’t even known for a week? Let me show you, see that smile? See the hope in his eyes? That is how. Now, I am not going to sugar coat this, was I very upset with his family dumping him? Absolutely! Has it been an easy peasy journey with Farley due to his cancer? No, no, no! Where the “sugar” comes in; Farley is here by my feet as I write this, one-year past initial prognosis. 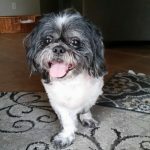 Farley has now become part of a children’s book series to help those that are facing medical challenges, showing how hope and love always will win. And, interesting enough, I no longer am angry with his former family. To his former family, if you are reading this, just know that Farley is doing well. Over the course of this past year, Farley has been on several road trips. 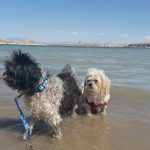 He has been to Utah, several times in fact; while there, he has been to Best Friends Animal Society, visited “Little Hollywood of Kanab UT, swimming at Lake Powell, and, has seen amazing Grand Canyon views that are just priceless. He took a road trip to CA to meet his most intimate “fans”; family would be a better description. On the way, he was not impressed with dinosaurs; he was over the moon with being Santa Claus and the hit of a Christmas party. His adventures were not inclusive to AZ, oh no; here in the past year he has been water fountain swimming; boating at Lake Pleasant; became a ninja; starring role in a children’s book; basking in sprinklers; even went swimming in a pool, and so much more. The biggest accomplishment? He has been in remission twice! As I mentioned above, this has not been an easy path for him or I. Due to the chemo, he lost over 30% of his hair, had several days where he was very ill, yet, he never stopped smiling. Here we are, July 12 2017, not knowing what tomorrow will hold for this precious gift from God. What I do know, Farley still has a lot of live left, places to go, people to meet, meals to eat, and a lot of adventures to be accomplished. The next time you see a pet posted for adoption or needs an immediate out of a shelter, go for it. Save a life! Fear of the unknown? I get it! Trust me! Take that fear, that negative energy and turn it around to a positive one; research, talk to others for help (oh the power of social media now!) and most importantly, open your heart and home to give a pet a chance. A second chance for love, a warm bed, a cuddle, a bowl of food and water, and so much more. Guess what will happen? You too will be rescued, and areas in your life that need improvement, the pet that you just saved, will become the best teacher you will ever have. Go save a pet’s life today and get ready for a priceless transformation, both for you and the pet. Life is short, embrace today because today is a present, not tomorrow. Farley, on the behalf of so many, thank you, thank you for brightening so many lives, including mine. 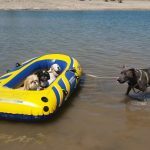 You are amazing… we are blessed to be your California friends and we luv’s you so much Farley, Woofff mom and I luvs you to the moon and back.